...it was good and bad. First off the Girl was in Minnesota at her first college soccer tournament. She scored her first collegiate goal while being injured so I'm pretty proud of her. My nasty chronic illness decided to rear it's ugly head and had me down in bed or on the couch all weekend, but was able to use some of that time wisely and sew if only slowly. Here's me on my couch covered in sewing and fabric. 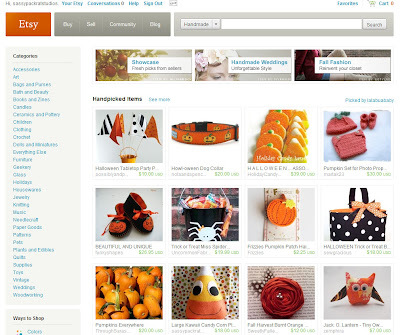 Friday I jumped, yelled, ran around and told everyone I know that I made the Front Page of Etsy! Well my Candy Corn Plush made the Front Page..same thing. Super excited because it made it in a treasury only the day or so before. My sweet plush treat has gotten 354 views! Yes I'm a little excited but that excitement carried me thru the rest of the crappy weekend. I did finish 3 Halloween plush dolls and will have one more finished today, so look forward to seeing them in the next couple of days. I also did a lovely Friday Feature on Wilde Designs too so please check it out and comment. Huge Congratulations on the front page! That is super exciting and very well deserved! I love that plushie!!!! Yay for the Front Page! Yay yay yay! Your stuff is so adorable, and your photos are so fantastic. You deserve it, and I am proud! And proud of your daughter, too. Now, take care, okay? Feel all better. I hope you feel better, you deserve to jump up and down a lot!!! Congrats on the feature on the FP! That's awesome. That would get you through a bad weekend. My favorite candy is candy corn. He's just too cute. If only he was edible! haha. Congrats on the proud momma moment too. WOW! That is so freakin COOL!!! That little candy corn is so adorable and you totally deserve to be on the Front PAGE! WaaHoo!